The PROPRIO FOOTTM is Ossurs latest addition from Bionic Technology. The world's first motor-powered and artificially intelligent prosthesis for transtibial amputees, the foot operates as closely as you can get today to natural, anatomical functioning. 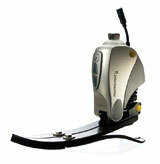 Identifies slopes and stairs after the first step and instructs the ankle to flex appropriately. Allows wearers to more easily sit down or rise from a chair. 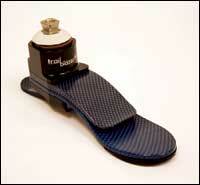 Creates a more symmetrical and balanced gait. Easy to set up and operate. In 15 steps, the device evaluates and memorizes the wearers unique way of walking. Forget the hassle! When you order offset adapter plates from SPS, the screws are included. Everything you need comes in one package. Economically priced, the SPS adapter plate configurations are machined to precision tolerance to meet your needs and those of your patient. Ossur's NEW Iceross® Synergy is the first liner to use the unique properties of two different silicone durometers to provide the perfect balance of comfort and stability. Active Skin Care and the Wave feature make this the most durable, comfortable, and flexible liner available. Designed specifically for moderate to active patients, the Iceross Synergy offers outstanding impact protection and stability in the outer layer of shock-absorbing DermoSil® silicone, while a softer DermoSil inner layer provides superb comfort and suspension. Available in 14 standard sizes and will retrofit to any Iceross standard 3mm liner. Nine-month warranty. TT-Pro Pylon, Mercury Hi-Activity Knee, Navigator Foot, Elite Foot, and the new Esprit Foot, Endolite provides intelligent interface systems that enhance the lives of people with limited mobility. Endolite also manufactures a complete line of standard pyramid and full alignment adapters, cosmetic fairings, and discontinuous cosmesis kits. At Velocity Labs, we've had experience manufacturing AK and BK double wall sockets since 1998. Both double walls can be used with standard expulsion valves and high-vacuum socket systems. 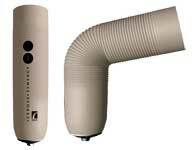 BK double wall systems are great for protecting the sealing sleeve and allowing for a full-skin cosmetic finish. AK systems separate the brim design from the mode of suspension, so the seal is not lost during sitting or volume fluctuations. Check out our website for information on all of our products from central fabrication to manufacturing supplies. The new Thoracic Extension (TE) option for the PacificTM Adjustable Collar from Becker Orthopedic fits your needs for low cervical/high thoracic immobilization. Competitively priced, the Pacific Adjustable Collar affords effective control and limitations of cervical spine motion. 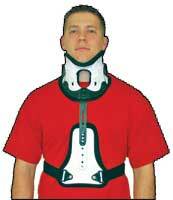 Available in one, height-adjustable adult size, the TE option easily snaps onto the collar. May be purchased separately or as a fully assembled CTO. The Pacific Collar is height adjustable within two predetermined ranges and can be securely and easily adjusted to ensure optimal alignment and comfort. Receive a FREE 30-can rolling cooler with every SPS purchase order for a new SilhouetteTM LP or the original SilhouetteTM prosthetic foot, manufactured by Freedom Innovations. This offer is valid on all orders placed through June 30, 2007. The new Silhouette LP incorporates an integral titanium male pyramid adapter ensuring easy and secure socket attachment. Delivering the same performance and slim profile as the original Silhouette, the new Silhouette LP simplifies the fitting process to save time and money. Sixty-day, no-risk trial period; 36-month warranty. Lower Extremity Prosthetic Systems give you a new model designed to drive best business practices for practitioners without sacrificing superb quality for patients. Otto Bock's Prosthetic Systems deliver a complete system from test socket through to definitive device for both transtibial and transfemoral amputees. Designs encompass the full range of mobility levels from K1 through K4. Call for your FREE poster! 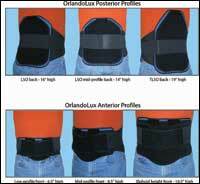 Combining the features of the OrthoLuxTM and the LumboLuxTM, the OrlandoLuxTM features front and rear pockets containing semi-rigid molded polymer panels, an elastic strapping system, and an anterior panel that is pre-drilled for attachment of the optional ExtenderTM. OrlandoLux is available in six unisex sizes (S-XXXL) and three heights (LSM, LSO, and TLSO), which you can mix and match to obtain the best fit possible. Same-day order fulfillment until 8 PM EST, three-day shipping for the price of ground, and a flat $20 fee for overnight shipping. The new OscillatorTM Knee, manufactured by Hosmer, is now available from PEL Supply. The manufacturer offers a one-year warranty. Independent flexion and extension adjustment. PEL Supply is the authorized distributor for over 45,000 products from hundreds of the worlds leading manufacturers. Our latest innovation in microprocessor knee technology. Activate it, and walk around. The SmartIP programs itself! The SmartIP adjusts to the optimum function as it automatically detects what is happening during the gait cycle. At any time, the wearer can activate the knee and re-program it to suit specific activities and environments. Enhanced range of walking speeds. SPS announces the immediate availability of the FullStrideTM stance control orthotic knee joint from Becker Orthopedic. re-engages to provide knee stability. Competitively priced, FullStride utilizes fewer specialized components to ease fabrication, reduce component costs, and reduce follow-up maintenance. Available as a kit, it can be fabricated using conventional metal and leather, composites, or prepreg into a variety of orthotic designs. The new Low Pro Summit Lock from Coyote Design offers zero-clearance suspension for patients without the space for other suspension methods. 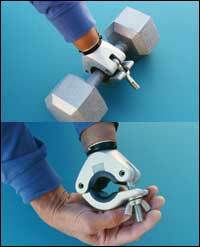 The lock is mounted proximally, similar to the original Summit Lock, so no room is required distally. There isnt even a need for a locking liner. The Low Pro Summit Lock is easier to don than the original and easier to cover cosmetically. Its multiple-tooth design walks itself into place allowing for touch-free engagement and adjustment. This is a high-performance, heavy-duty accessory designed for the most demanding weight training. The Black Iron Master (BIM) provides unparalleled security and stability for heavy weight lifting, bench pressing, dumbbell flys, dead lifts, squatting, etc. It is also useful for adapting to a wide variety of other exercise equipment available in modern fitness facilities. A swinging gate clamps the bar between rubber saddles. It is manually secured in place with a large wing nut. There are no quick release or other breakaway features. Forged aluminum and steel construction. Load rating 1,650 lb. Do You Have An Up-To-Date Policy & Procedure Manual? Is Your Facility Accredited? According to the new Medicare Supplier Standards, you will need to be Facility Accredited. OPGA offers a manual to assist in the daily operations of your business. The manual is in an easy-to-read format, customizable to your own business. You receive a binder to choose which policies you require and a CD, which you can edit to fit your companys needs. Create your personalized manual in weeks, not months! Also included in the manual to assist you in making it through the ABC Facility Accreditation Process, you will receive the current FAP standards. Now through June 30, 2007, you will receive a $100 discount on the purchase of a new Trailblazer MA foot from Ohio Willow Wood. The foot ankle combination in the new Trailblazer MA provides exceptional performance and stability. Compound Spring SystemTM maximizes the effectiveness of the toe springs and provides energy return in a low-profile foot. Three PerforMaxTM heel springs provide variable heel action and customization. Five toe springs stiffnesses ensure the right amount of flexion and comfort for each individual.